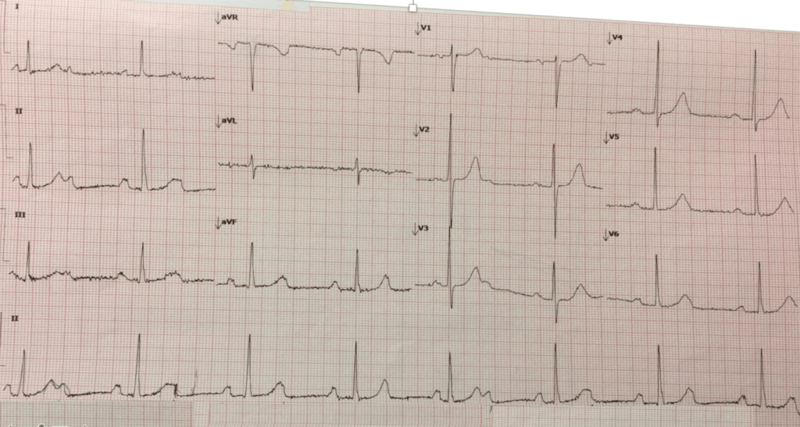 A 58 year old male presents with an episode of pre-syncope. On arrival he feels well. He describes a similar episode a few days ago and has had a few episodes of what he calls minor chest tightness, lasting 2-3 minutes. His past history is of hypertension and he is a smoker. His vitals are HR(as shown below), BP 128/62, sats on room air 96%. Are there more P waves than QRS’s? Yes–think of a MOBITZ block. The extra P’s a partly and sometimes totally hidden in the T waves. This is that one time where the QRS complexes aren’t clumped. The P waves are also equidistant ie., the P-P interval is regular. If it wasn’t it would be premature atrial contractions. It is a MOBITZ II with a 2:1 Block. In some examples the p wave is totally hidden in the T wave with only a minor abnormality to make you think it isn’t. If suspicious, look at the morphology of the T wave. It should be a gentle symmetrical bell curve.